If you remember, something that is normal not, this month there will be a solar eclipse (that is, the Moon interposes between us and the Sun). Eclipses (in their broad sense) offer us a very special moment to observe the upper layers of the element to which we “cover”. 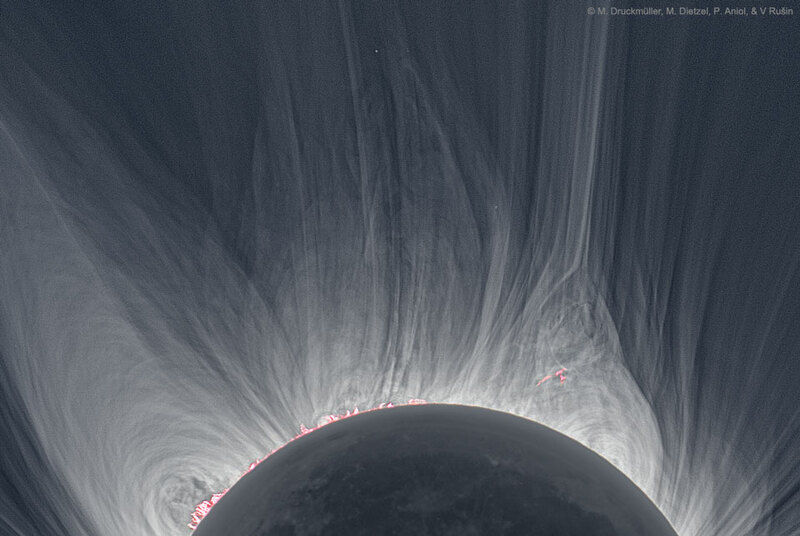 In the image you have the spectacular view of the solar corona thanks to the 2008 eclipse that allowed astronomers to see the solar atmosphere. Apart from, as I said, being a beautiful image, it serves, the image, to see the intricate solar magnetic fields and how these influence the solar time. In fact, it is possible to observe perfectly the plasma loops, coronary ejections that are attracted again by the magnetic field and the gravity of the Sun or those that are expelled to become solar winds generated by the Sun. The truth is that it is a spectacular image, not only for what it means and what it is worth, but for its appearance. It could go into detail as this technique is used to observe the atmospheres of the planets (the most recent example we have with the New Horizonts probe and Pluto) or even when we are surprised by telling us the possible atmosphere that have planets outside our solar system . We can do the test very simply. A closed box by which we let pass a small ray of light, a prism to break the incoming light and a photo (precise, yes) of the decomposed light to obtain the elements by which that light has passed since these Will absorb certain frequencies and therefore, the light will indicate to us what materials it contains.